When I learned this secret to fake calligraphy, it made all the difference. You may have also heard the word fauxligraphy. I was a hand lettering beginner and I finally understood how to do thin upstrokes and thick downstrokes! I’m not a beginner anymore, but I still love fauxligraphy! Before I even had a brush pen, I made everything with my Pilot G-2 pen. People started noticing me on Instagram. They would ask what brush pen I was using… I felt like I needed to keep it a secret because I wasn’t actually that talented, I didn’t know how to use a brush pen! Then I realized that fauxligraphy is a real thing that everyone uses, not just beginners. If you ever want to use a paint pen or chalk pen, you are going to need to know this skill since they don’t come in brushes. Also, it’s really fun and you don’t have to worry about transitioning from thick to thin strokes! Write a word in cursive with a pen or pencil. Thicken each downstroke by drawing a line and filling it in. That’s it! It couldn’t be more simple! 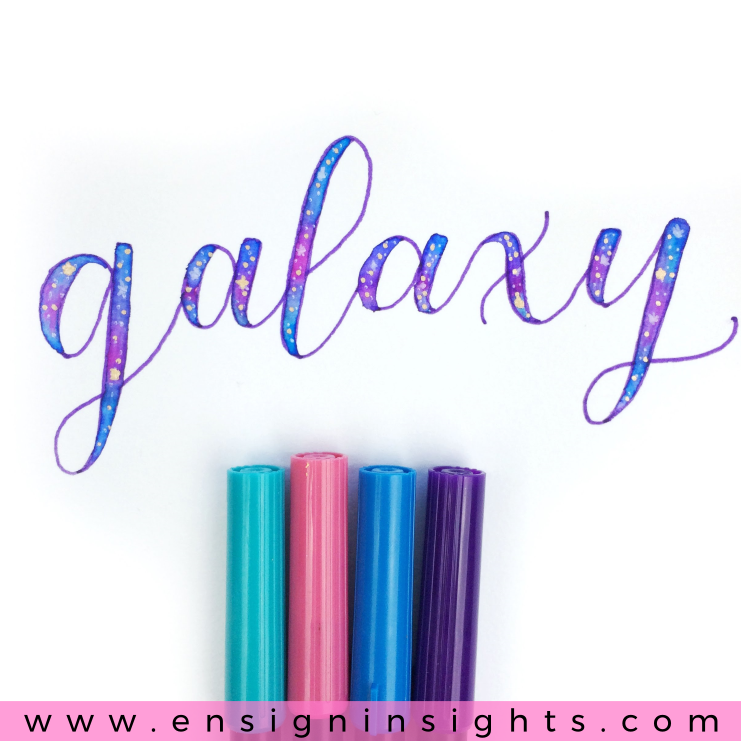 In my video above, I share how to do galaxy lettering with this technique. This is such a great way to start learning your style because you can play around with the letters and words without worrying about how to use a brush pen. 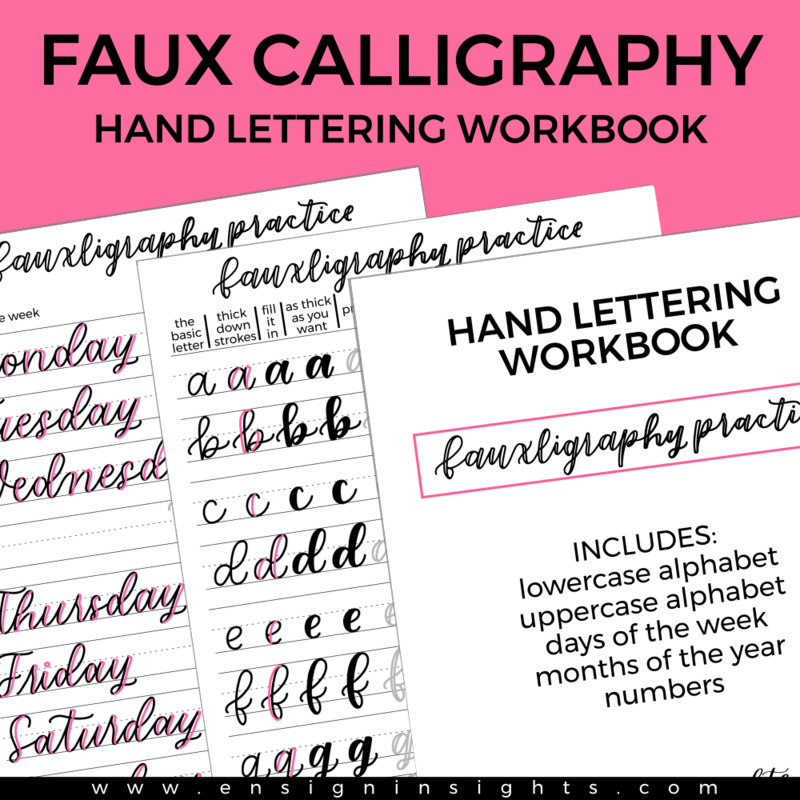 I created a hand lettering workbook for fauxligraphy practice to help you get the hang of it. It’s a fun, cute script style and it includes the lowercase alphabet, uppercase alphabet, days of the week, months of the year, and numbers. So it’s really practical since anyone will need to write those words at some point! This will be especially helpful for a bullet journal or planner. The best part is that you can print it out on any paper and use any pen. You don’t have to invest in brush pens to start!